I said, “I never had the audacity to argue with you in my life, and never disagreed with you looking in your eyes. However, what we are discussing now relates to taking decisions on the basis of Qur’an and Hadith. I have decided to join Jamaat-e-Islami for the same reason when I joined Tablighi Jamaat. “Father, one needs to take decisions on the Deen after properly reflecting on things and after much contemplation. 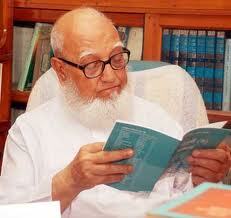 I want to give you some books about Jamaat-e-Islami so that you know about them well. Mawlana Abdul Aziz has written such letter to you because he doesn’t know much about the organisation.” He became angry again and said, “I know Mawlana Abdul Aziz very well and am confident that he couldn’t write such a letter without knowing about it. You have to return to Tablighi Jamaat”. Looking at him, I felt that my worries were over for the time being. He returned to Dhaka the next day. I gave him the same two books Mawlana Abdul Khaleque had given me before I joined Jamaat. After much thought I gave my father another Urdu book to read, but he criticised the book in our next meeting. I tried to prove why the writer was right and my brother also tried to support me. By then I realised that even the book of Allah can be misinterpreted if it is not read with a neutral mind, so I decided not to give any more books to my father for the time being. I started working with the Dhaka city branch of Jamaat-e-Islami while on college holidays. In one such programme there was tafseer (Explanation of Quran) session by a scholar who was explaining the verses from Sura Luqman where the prophet Luqman was giving some advice to his sons. The part of I liked most is how to manage the situation when there is a conflict with parents about the Deen. It seemed to me that those verses were revealed to resolve my situation. I had read them many times before, but never before had they appeared so meaningful to me. My brother was successful and my father started asking me for books. I felt much relieved for the improvement of the situation. A few days after I returned to Rangpur after the holidays I received a letter from my father in which he asked me to go to Khulna where the Central president of Tablighi Jamaat Hazratji Mawlana Yusuf was supposed to attend a conference. I knew that my father had softened from his previous stance against Jamaat that he had developed through the wrong impression given to him about Jamaat by the then East Pakistan President of Tabligh. However, reading Mawlana Moududi’s books may have made his position softer, he still wanted to ensure that I was doing the right thing by making me have a face-to-face meeting with Tablighi leaders. I reached Khulna as per my father’s instruction, while my father and brother Ghulam Muazzam arrived from Dhaka. There was no scope of meeting the Tablighi president in Khulna and we heard that Hazratji had assigned a leader of Tabligh Mr Faridi to talk to me. I took the reserved river boat along with Mr Faridi, my father and brother towards Dhaka so that the conversation could take place. However, my father was not at all satisfied with that conversation as Mr Faridi gave me little opportunity to talk and kept insisting that I should go for another Tablighi chilla. Meanwhile I got arrested for my involvement in the language movement and also lost my job with the college due to that. After being released from jail, I joined Jamaat-e-Islami full time and in May 1955 I went to the then West Pakistan for some important political lobbying. Before starting for Karachi I left a shelf full of books related to the Islamic movement in my father’s bedroom, and asked my ever-helpful brother to convince my father to read as many of them as possible. When I returned in December, my father had read a number of those books and I learned from my brother that his attitude towards Jamaat was getting more and more positive. My father arranged another meeting between me and the Tabligh leaders. This time it was with Mawlana Ziauddin Aligarhi who was one of my teachers during my Chilla in India. We went to Kakrail Mosque for the meeting where I met both Mawlana Aligarhi and East Pakistan Tabligh President Mawlana Abdul Aziz. I could see almost 30/40 brothers of Tabligh sitting around me and praying. I realised that they were praying for my return to Tabligh. Mawlana Abdul Aziz tried to remind me that their methodology was right and was followed by many big scholars. When I tried to say that if those scholar read the full explanation of these Quranic verses, then they too would be convinced and many more people would get the real light of Islam, he became angry and said, “So you mean we have no knowledge about Islam? We don’t read any books if not suggested by our senior leaders.” Saying this he stood up while Mawlana Aligarhi remained silent. Soon, we returned home. Coming back home after my meeting with the two Tablighi leaders, my father said to my younger brother in my presence, “They don’t have any ability to debate with your brother. They were not even prepared to discuss the matter. I took him to meet them for discussion, but they surrounded us with a group of Tablighi people and kept giving their own opinions in front of them. When he was about to speak, they moved him away from other people, probably in fear that others would be convinced by his words. They took him inside to talk in secret, but even there they stopped him and didn’t let him finish his side of the argument. What they said angrily when being asked to read the Tafseer of the Qur’an is completely illogical”. I felt very relieved after this and felt happy that my father no longer accepted the accusation against Jamaat-e-Islami that Mawlana Abdul Aziz had made to him. A heavy weight was released from my chest. There was an effort to create an unfortunate conflict with my father by spreading fabricated accusations against Jamaat-e-Islami, whereas it was he who brought me up since my childhood in the way of Islam. This incident remains one of the saddest events of my life. Had they not given the fatwa “Jamaat-e-Islami is worse than the Qadianis” then I wouldn’t have endured that suffering and my father wouldn’t go through such stress for three years. How dangerous a fabricated fatwa can be! Since that incident my father lost interest to go to Kakrail Mosque like before.